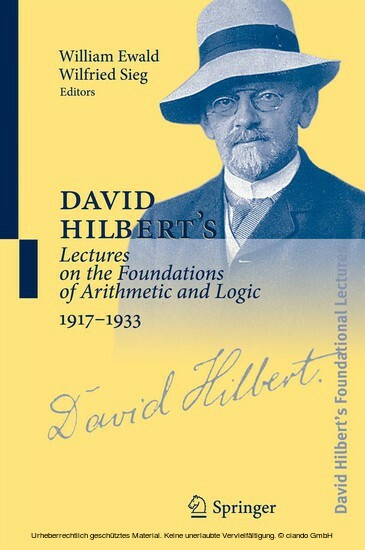 The core of Volume 3 consists of lecture notes for seven sets of lectures Hilbert gave (often in collaboration with Bernays) on the foundations of mathematics between 1917 and 1926. These texts make possible for the first time a detailed reconstruction of the rapid development of Hilbert's foundational thought during this period, and show the increasing dominance of the metamathematical perspective in his logical work: the emergence of modern mathematical logic; the explicit raising of questions of completeness, consistency and decidability for logical systems; the investigation of the relative strengths of various logical calculi; the birth and evolution of proof theory, and the parallel emergence of Hilbert's finitist standpoint. The lecture notes are accompanied by numerous supplementary documents, both published and unpublished, including a complete version of Bernays's Habilitationschrift of 1918, the text of the first edition of Hilbert and Ackermann's Grundzüge der theoretischen Logik (1928), and several shorter lectures by Hilbert from the later 1920s. These documents, which provide the background to Hilbert and Bernays's monumental Grundlagen der Mathematik (1934, 1938), are essential for understanding the development of modern mathematical logic, and for reconstructing the interactions between Hilbert, Bernays, Brouwer, and Weyl in the philosophy of mathematics.